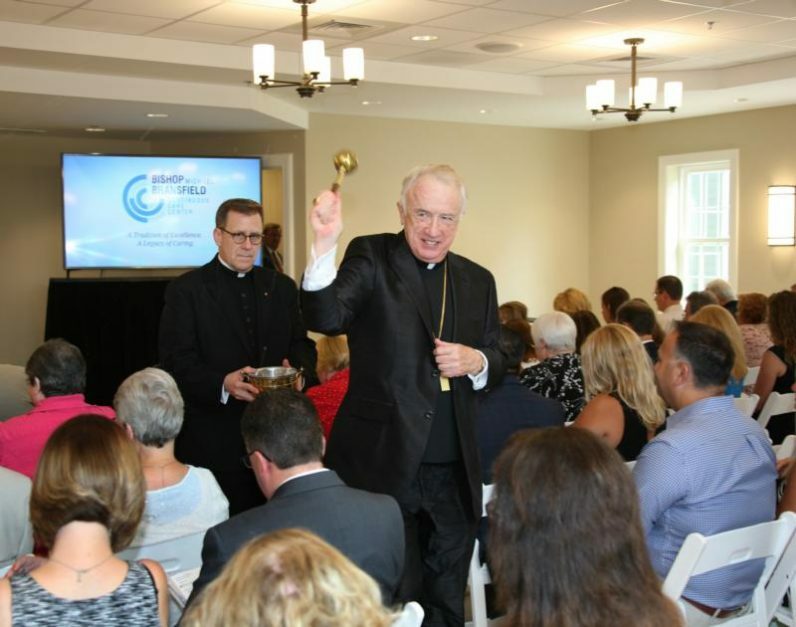 Bishop Michael J. Bransfield of Wheeling-Charleston, W.Va., blesses the new Continuous Care Center July 14 at Wheeling Hospital, which was named in his honor. With him is Msgr. Kevin M. Quirk, president of the hospital’s board of directors. (CNS photo/Colleen Rowan, The Catholic Spirit) See WESTVIRGINIA-CONTINUOUS-CARE July 23, 2018. WHEELING, W.Va. (CNS) — Bishop Michael J. Bransfield of Wheeling-Charleston blessed and dedicated the new three-story, 107,000-square-foot Continuous Care Center, nursing care facility, operated by the diocese’s Wheeling Hospital July 14. In a surprise for him, it was announced that the center has been named in his honor. “I am very grateful,” he said. In his homily for the blessing and dedication, Bishop Bransfield said that the new center is for the community. The Bishop Michael J. Bransfield Continuous Care Center sits atop a hill overlooking the diocesan-owned Wheeling Hospital and the surrounding area. It provides 144 private patient rooms, 20 more than the current center. It also features: two outdoor, landscaped courtyards; a large chapel; five patient/family lounges; a healing garden; five restaurant-style dining rooms; a spa with a hair salon and a jet tub; two patient activity rooms; a large, fully equipped physical therapy center; and state-of-the-art main kitchens and four smaller country kitchens. Bishop Bransfield thanked Violi for the new center and for all that he has accomplished over the years for the hospital, as well as linking the hospital to Wheeling Jesuit University. He also thanked Msgr. Kevin M. Quirk, president of the board of directors of Wheeling Hospital and chair of the board of trustees of Wheeling Jesuit. The new Continuous Care Center is a continuation of Bishop Bransfield’s commitment to health care in West Virginia. In 2012, Wheeling Hospital opened a seven-story, 144,000-square-foot building addition known as Tower 5, which brought a variety of enhanced medical services to the state in the areas of trauma, pediatrics and critical care, among others. Five years later, the bishop blessed the hospital’s Cardiac Catheterization Lab. In addition to chest pain and heart attack, the lab treats heart conditions such as atrial fibrillation and also implants pacemakers and defibrillators. It also is used to diagnose and treat virtually a many other cardiovascular diseases. Wheeling Hospital has a unique role in the history of the diocese, Msgr. Quirk said in his remarks, noting that the hospital is older than the diocese. Bishop Richard V. Whelan helped found the hospital, he said, which was chartered in 1850. “So it can be said that the diocese has been involved in health care throughout West Virginia longer than its own existence,” Msgr. Quirk said. “This is an integral part of preaching the Gospel. We understand from Christ, our savior, that it is our mission and our role to be his healing force in the world, to provide for the needs of those around us for the betterment of their health and well-being … to take care of the poor, to feed the hungry, to clothe the naked. The work of the hospital, he said, has always been centrally important and has always been guided by the diocesan bishops, who have continually intervened in the life of the hospital, encouraging it to grow.